Gail: Roarke! Roarke! I've told you for the 157th time, turn that damn music off. I'm losing my hearing. Jeez. You gotta find your sneakers buddy. You owe me. The teacher Gail Hartman (Meryl Streep) is facing problems with her marriage with her husband, the workaholic architect Tom Hartman (David Strathairn). 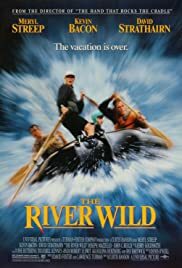 On the birthday of their son Roarke (Joseph Mazzello), Gail decides to leave her daughter with her parents and take her family to raft down a wild river where she was a guide. On the departure, a young man named Wade (Kevin Bacon) befriends Roarke and leaves the place with his friends Terry (John C. Reilly) and Frank (William Lucking). Later the family encounters Wade and Terry, who do not have rafting experience, and Gail helps them to cross a whitewater. They get closer to the family and soon Gail and Tom learn a dark secret about Wade and Terry. What will they do to get rid of the men? Twenty-three years after its release date, "The River Wild" is still a breathtaking film. The story is predictable and corny in some moments, but the action scenes are still impressive. The forty-five year-old Meryl Streep is athletic and looks younger and younger. Unfortunately the DVD does not have making of since the scenes of white-river rafting are amazing. My vote is seven.